Do you know the old song "You Were Always On My Mind" by Willie Nelson? Well, to prove you are always on *my* mind, I wanted you to know I was thinking of you while attending an annual magazine conference in Atlanta yesterday! Each year the tables are practically buckling under the weight of all the free magazines available to attendees. Since I already subscribe to quite a few Hoffman Media titles myself, I decided I would give these seven freebie magazines to one of you! Although Tea Time wasn't included (and many of us already get it anyway), I was happy to see the new Victoria has a great article on "The Art of Afternoon Tea." I haven't even had time to look through all the other titles myself, but I have a feeling they will be of interest as well. 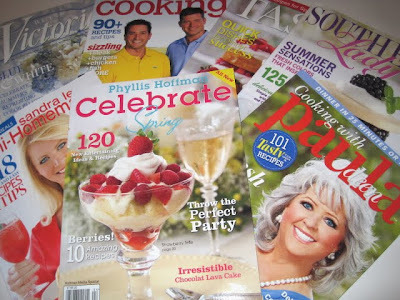 The titles include Victoria, the Deen Bros. Good Cooking, Taste of the South, Southern Lady, Sandra Lee Semi-Homemade, Phyllis Hoffman Celebrate and Cooking with Paula Deen. This giveaway will run until 7 a.m. EST Monday morning, May 3. To enter, just answer this question: What is your favorite magazine (or magazines)? And good luck! I knew it was going to be a good day at the office when I checked my mailbox the other morning and found a great new tin of tea and a mystery card awaiting. I was puzzled until I read the card and realized my tea-lover friend Gwendol is in town for a few days, and she remembered me saying I liked puerh and wanted to pass along some that she didn't care for. This tin is one that comes with a protective lid beneath the cap, and as soon as I removed it I was struck by the most wonderful scent. Now I like plain puerh just fine, which was a surprise to me since it's really an earthy flavored tea and not some traditional blend. Puerhs are teas that are aged, and some say they are an acquired taste. 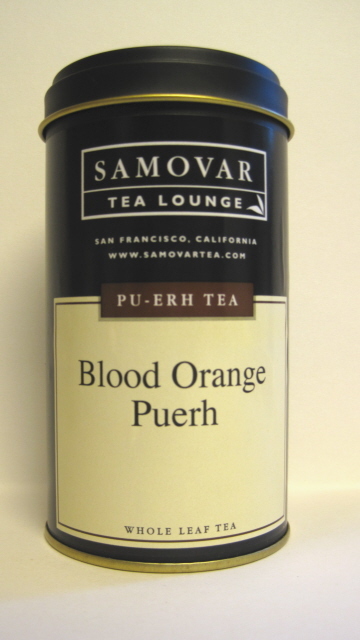 I tried and enjoyed several puerhs during my year of tea tasting in 2009, but I did not know that there was such thing as a flavored puerh. Interestingly, the directions on the tin tell you to immediately rinse your tea leaves with hot boiling water, pour off that water, then add more water and steep (I steeped mine for four minutes). I was afraid I was pouring off all the flavor because the discarded water turned such a dark brown so quickly, but I needn't have feared. The citrusy flavor of this puerh was just wonderful, and I believe I had a total of about five cups of the dark black tea that first day. My friend loathes it (her word), and I love it. 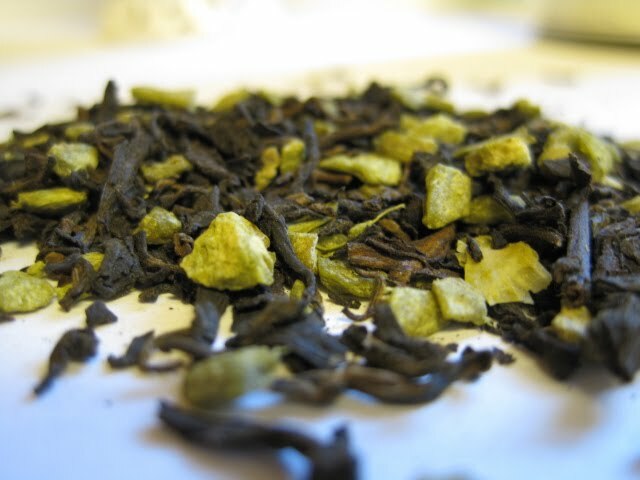 If you're thinking of trying a puerh, I have to say I like everything about this one, and you can see their web site here. Any more puerh fans out there? 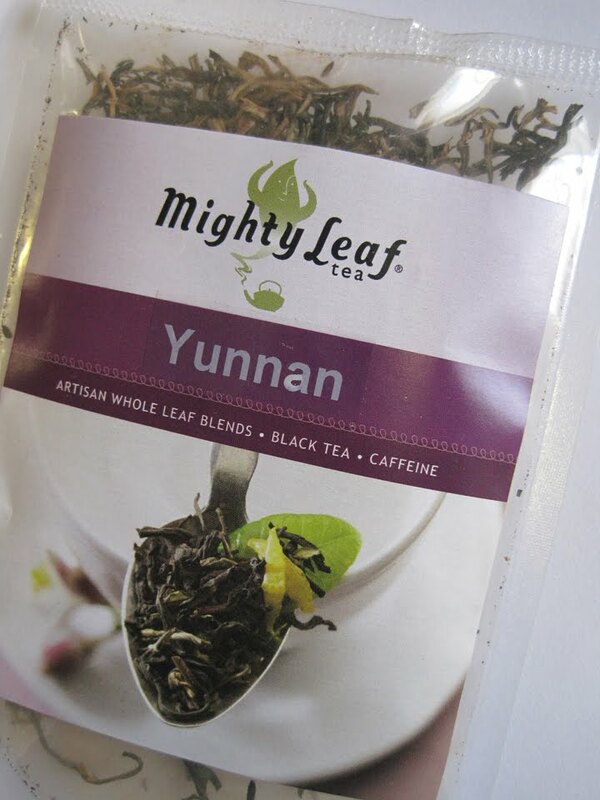 And if so, have you tried this tea? I'd love to know! 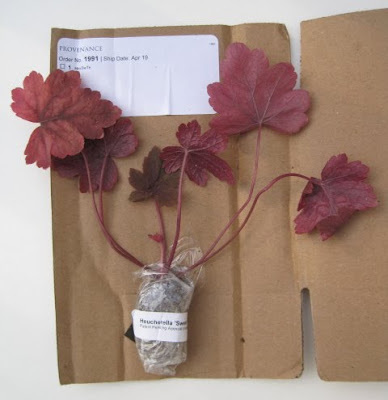 In other "tea and gardening" news, I was thrilled to go to the mailbox the other day and find the "plug" I had ordered had arrived. 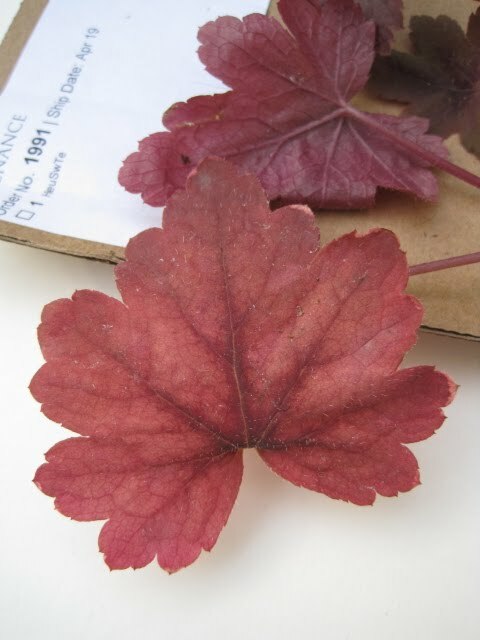 This heucherella (common name: foamy bells) is one I ordered because of the pretty foliage and because of the name. I planted this in my new shade garden that is in progress, next to some ferns. 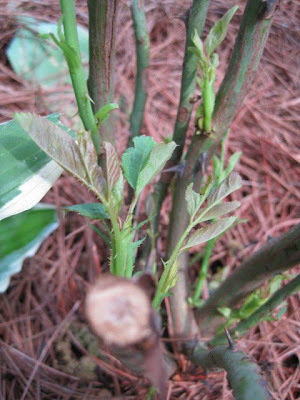 It is said to grow and spread very fast, so we'll see! 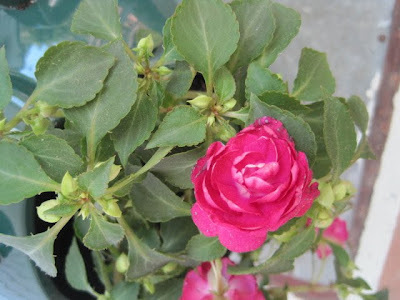 And finally, some of you have asked about my new 'Tea Clipper' David Austin rose planted on April 5. Look at how well it's doing! Little green shoots are popping out all over. When the blooms finally arrive, I'll probably have a party to celebrate! My tea-themed jewelry is such a diverse little collection, I've really come to view and appreciate it as art. It's not the value of it (I *rarely* pay more than $5 for anything), but it's the uniqueness of some of the pieces I find so charming. 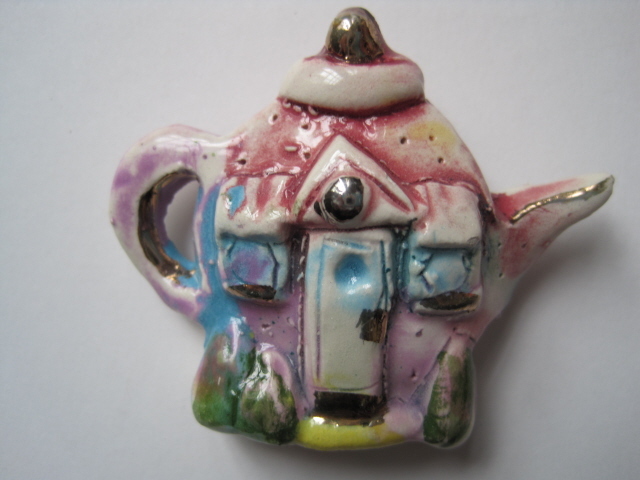 One of my newest pieces is this ceramic teapot brooch/pin, which is signed on the back "JL '99." It looks like a colorful pastel cottage and has lovely gold highlights. At 2-1/4 inches wide and 1-3/4 inches tall, it's probably my largest teapot pin, and it was an eBay find that was just $1.30 -- and shipping was free. I can't imagine why the seller let it go so cheaply, but hey, I know a bargain when I see one! 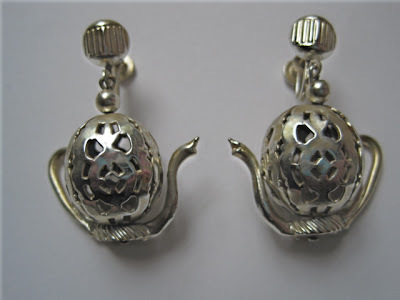 I was beginning to think I'd seen every design of vintage teapot earrings that exists, but then I came across this unique filigree looking pair. 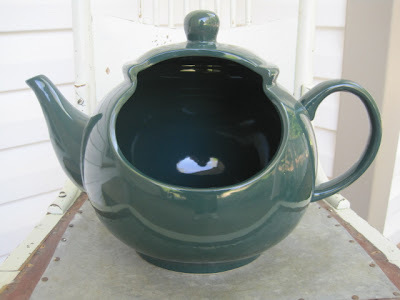 They're unsigned, but the style and large charm-type teapot (the teapot alone is about an inch tall) strike me as a forties/fifties era design. I'd wear these with the right outfit one day, but for now these are merely collectibles. 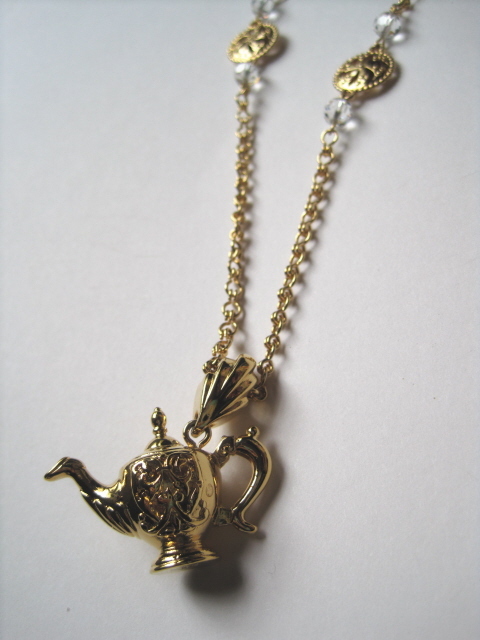 Finally, a more modern piece was this gold teapot necklace from Monet, yet another eBay find. I love that the chain is a nice long one (about 36 inches), and the simple clear beads and gold accents make it a good fit for some of my dressier clothes, particularly a few shirts I have with gold threads running through the design. It's fun to find jewelry that reflects my hobby, and I'm always happy to find new "artwork." 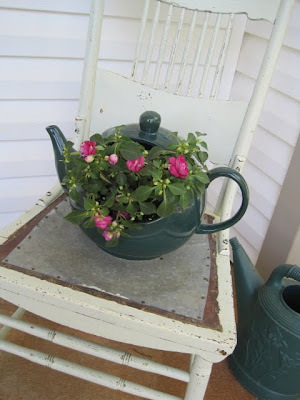 Tea and gardening--I'm finding it quite easy to combine these two loves. My weekend project, for instance, consisted of taking a junk store wire teapot and turning it into a pretty, mossy decorative piece to hang on a small garden gate. 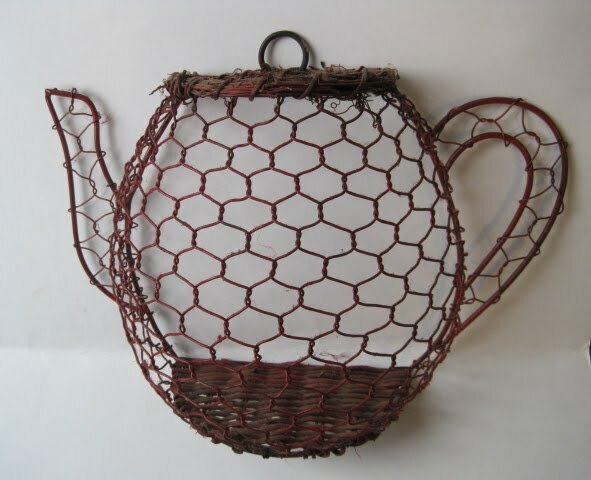 I came across this wire form at a junk store several weeks ago and bought it even though it is red, and I don't decorate with a lot of red. But it was just $3, so the price was right. Determined to use only the supplies I had on hand to transform it, I used an old 50-cent bottle of black craft paint and did a purposely rough job of painting. This did not need to be perfect. It just needed to not be bright red! Moss from the yard was easy to scoop up and pack down onto the chickenwire form. 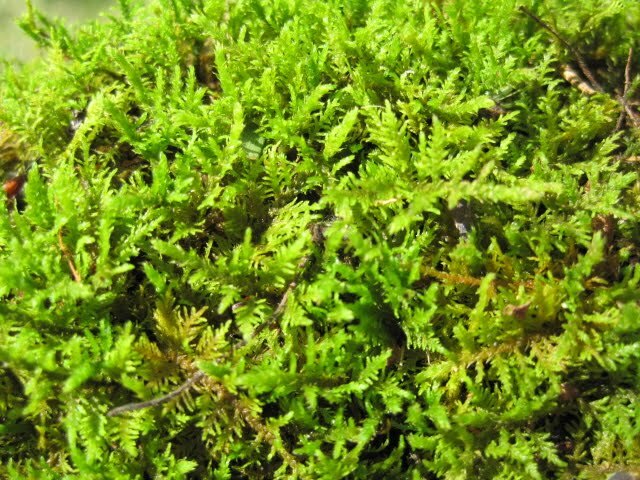 This particular moss looks almost like tiny ferns, doesn't it? 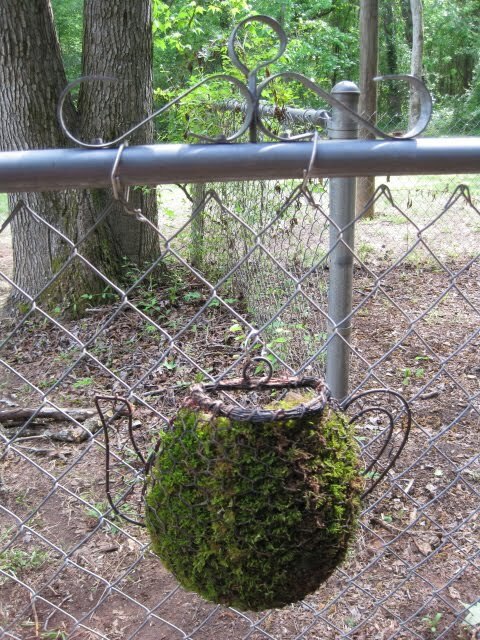 The finished piece hangs on the gate of what is going to be my small tea garden. The planning is still underway, but I wanted something tea-ish there to inspire me as I work. I think my $3 junk find does the trick! Tea and Books Saturday #17 - "Time for Tea"
I first read this book at the time it was originally published, but a recent reading of "Time for Tea" made it feel like a whole new book to me. 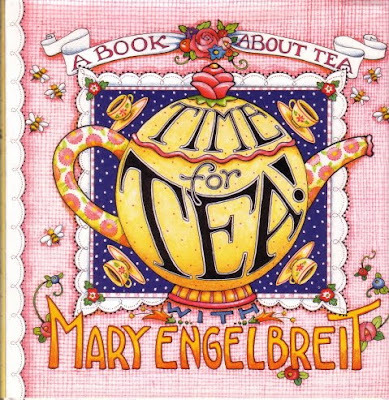 Of course, those of us who love artist Mary Engelbreit's lovely tea-themed artwork can't help being drawn to a tea book that is all-Mary, all the time. Ever wondered why her work so often features teawares? "When I was little, my sisters and I were constantly holding tea parties," says Engelbreit. "There was always one going on somewhere around the house—in the yard, in our bedrooms. 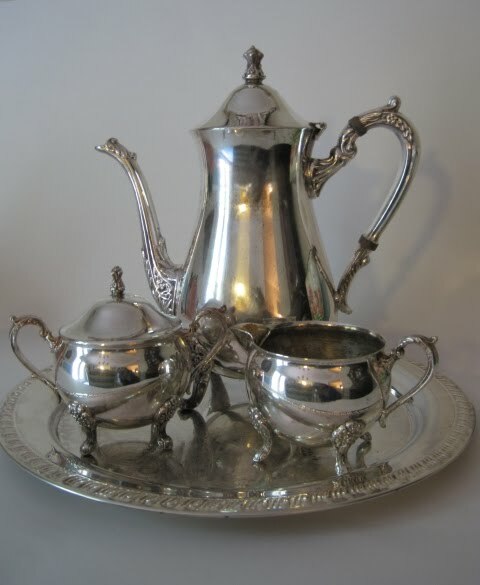 And even then we were into collecting, picking up tea sets at dime stores and garage sales. 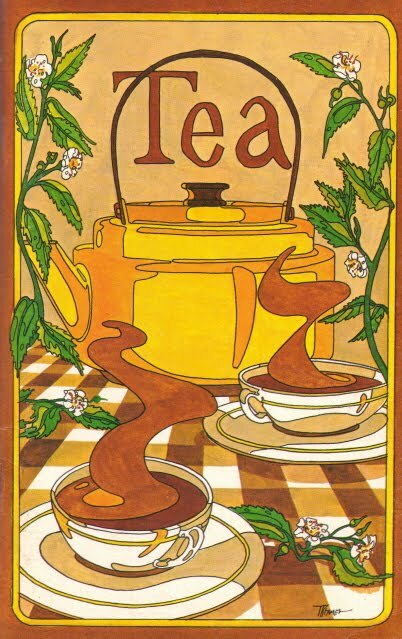 The magic of tea is still very much alive for me, and the subject certainly has a way of popping up again and again in my illustrations." And aren't we glad it does! This small gift book is a fast read and would also make a great introductory tea book for a friend just learning the pleasures of teatime since it includes a handy primer on some of the most popular teas. There are lots of ideas for helping children enjoy teatime—such as a Nursery Tea for the dolls and teddy bears and a children's dress-up tea party—but there are also ideas for adults, such as a Wedding Tea and taking tea in the garden. 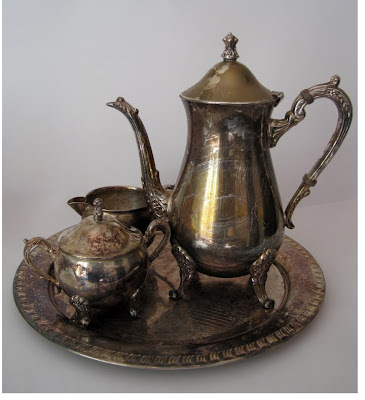 There are lots of Engelbreit illustrations featuring tea, which is reason enough to enjoy this book, but there are also some lovely photos of teawares and tea collectibles. 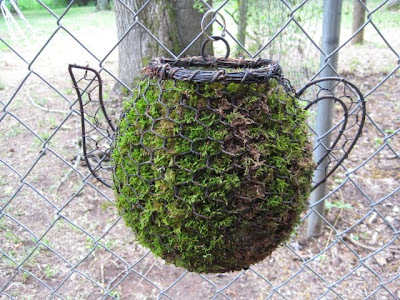 I also learned a tip I don't remember ever reading before: knitters (and crocheters, I would add) can place a ball of yarn in a teapot and pull it out through the spout in order to keep the yarn tidy! Now that's a fun idea! So this book was like a brief teatime chat with a friend: It was short, sweet and utterly enjoyable! Around the holidays last year, I found the most delightful thing at a T.J. Maxx and More in Marietta. These Dobla chocolate Coffee & Tea Cups looked simply wonderful, and I tucked them carefully in the back of the pantry for safekeeping. I planned to fill them with one of those yummy white silk fillings (mostly cream cheese and heavy whipping cream) next time I hosted a tea party. 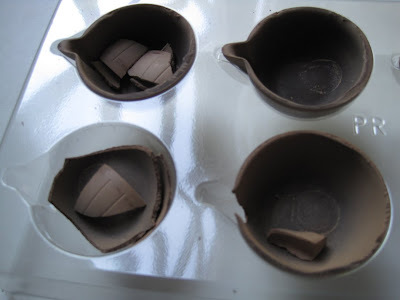 Alas, that tea party got delayed much longer than I expected, and I wondered if the cups would still be usable. Alas, they were not. 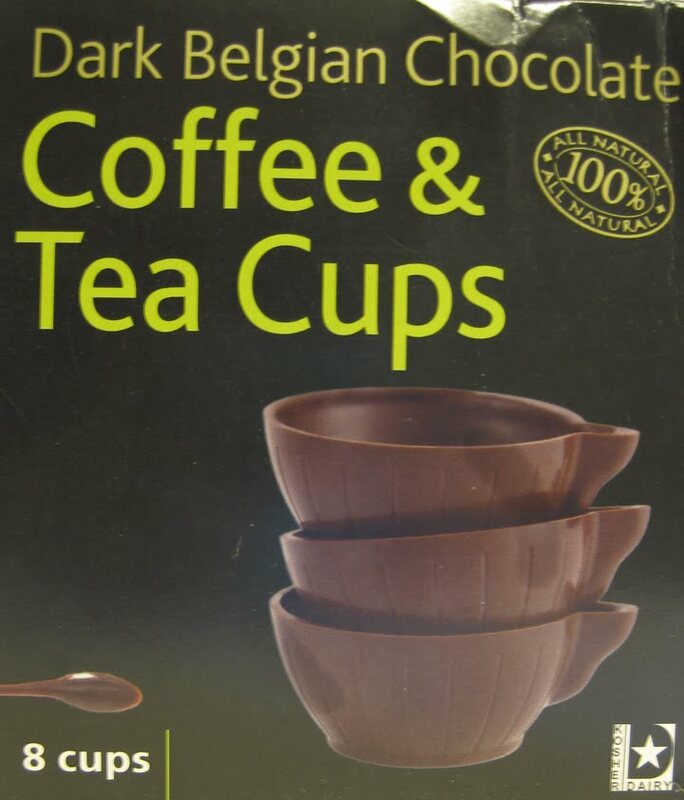 In fact, I was quite dismayed to open the box and discover the cups were not enclosed in some sort of plastic or foil covering as I had assumed they would be. Not only were several of them broken (did that small dent in the corner of the box do all that? ), but clearly the air and time had done its damage. I can't help wondering what they would have looked like if I had opened them at the time I bought them. I really need to do some research about how long chocolate stays fresh. What should have been a pretty, glossy cup was just a dismal little musty mess. Here is what it should look like. I do hope I'll run across these again one day, in new, fresh condition, but I don't think I'll take my chances at a discount store again knowing what these looked like. 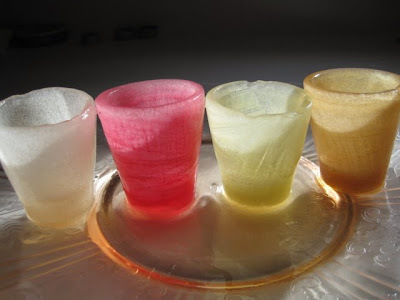 Have any of you ever come across these cups and tried them? I'd love to hear a report from someone who got good ones! 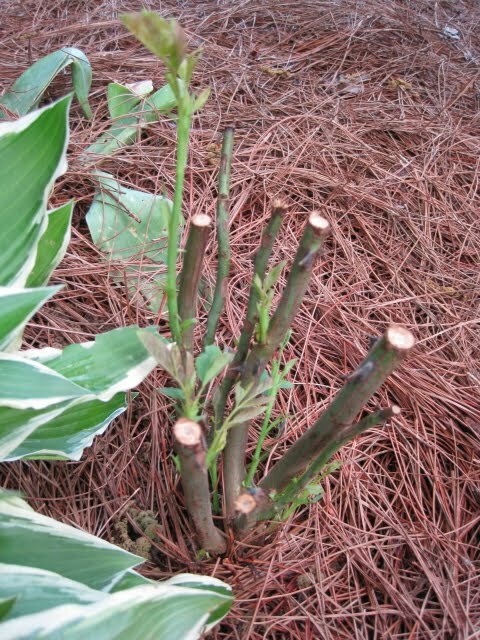 And this is what it looked like after! Not bad for $7, I thought. Included in the deal were a few souvenir teaspoons as well, and these I haven't polished yet. They're from Japan, Chicago and Florida. I'm not quite sure what I'm going to do with them, but I do think it's the start of a fun collection and I'm happy he was keeping an eye out for me but in a thrifty kind of way. I am, however, still shuddering from the yard sale horror story my mother shared last weekend. She was going to yard sales, looking for a few more things for the new house, when she ran across a sale which was just jam-packed with stuff. My mom said there were bedspreads and flower arrangements and junk galore. She found a vintage Fenton vase (ruffled) for $1. She found a gorgeous vintage pink glass "Gone With the Wind" globe lamp, handpainted with roses, for $5. As she looked around, a woman told her not to miss the garage. Mom said she entered and just stared in amazement. Stacked up to the ceiling were designer bedspreads still in the bag, throw rugs with the tags still on them, sprays of silk flowers with prices attached and much more. There was so much stuff it looked like a warehouse had been unloaded in that residential garage. "I just have to ask," she said to the woman, "do you mind telling me where all this came from?" "No, no I don't," the woman said. "I don't mind telling you at all. It's our (points to her brother) mother. She is a complete shopaholic and she is going to have to stop. My brother and I are trying to help her keep her house because she quit making her house payments so she could go shopping." The woman went on to explain that after her father's death, her mother started shopping like crazy, buying things in multiples, and shopping as often as she could, just for the fun of it. "Is she here now?" my mom asked. "No. You know where she is? She's out shopping!" I like shopping for my teawares, but if the garage starts overflowing and we can't pay the mortgage, it's time to quit! A month or so ago, I was at my sister's house using her handsoap when I noticed the wonderful fragrance that remained on my hands. I picked up the bottle to see what kind of soap she was using, and lo and behold, it was a Method brand Green Tea and Aloe handsoap I'd not come across before! She got hers at an Ingle's grocery store nearby, but we don't have an Ingle's here so my search was on. Kroger, I'm happy to report, was well-stocked with this brand, and I was delighted to find a bottle. I was, of course, curious about whether it actually contains green tea, and since camellia sinensis is not on the ingredients list (but aloe vera is), I assume not. 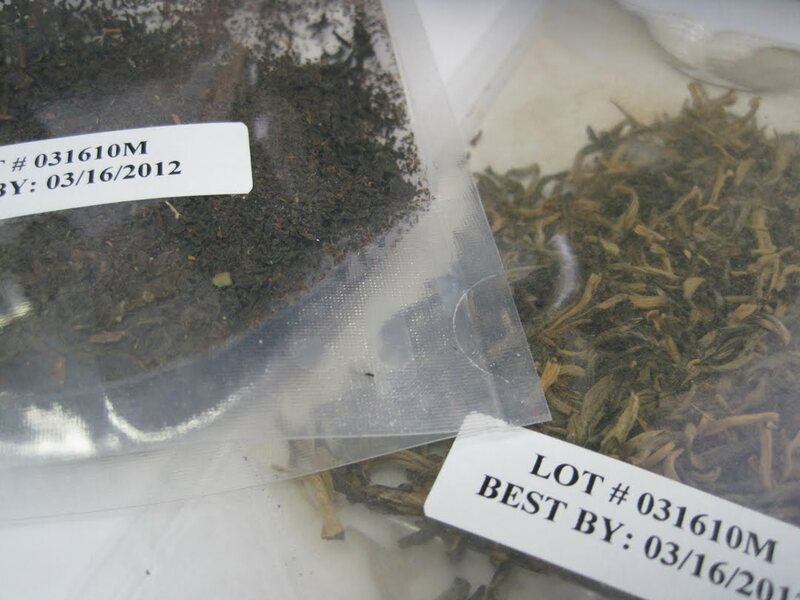 I have e-mailed the company to ask whether camellia sinensis is an ingredient but have not heard back yet. Either way, I love the scent of this soap and am pleased with it. 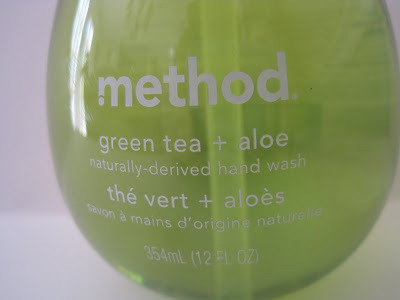 Have any of you used this soap? Or other Method products? If so, what have you tried and liked? UPDATE: Got a not-very-helpful response from the company. It said this: "Unfortunately, we cannot disclose the specific ingredients that are in our fragrances because that information is confidential to the folks who supply our fragrances. 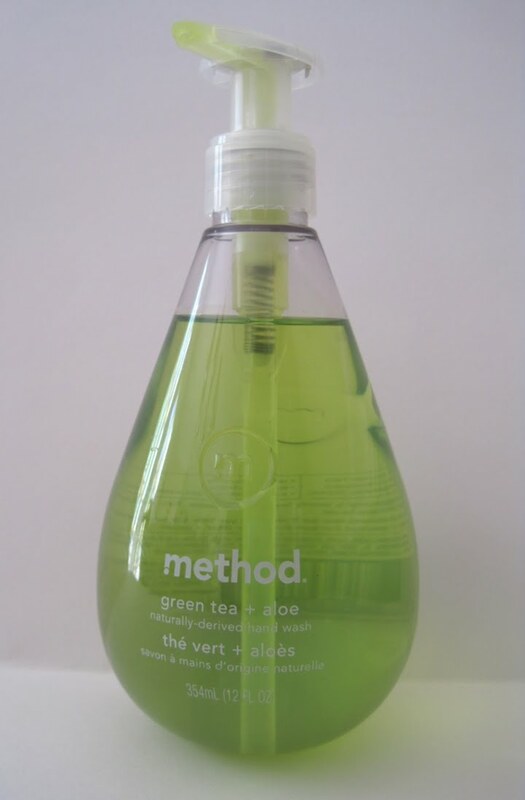 If you are concerned about an allergy or possible health reaction to green tea, we would recommend you choose another fragrance or try our Free & Clear, which does not contain any fragrances." I'm not sure what to think of a company that won't tell me whether it's Green Tea product contains green tea! 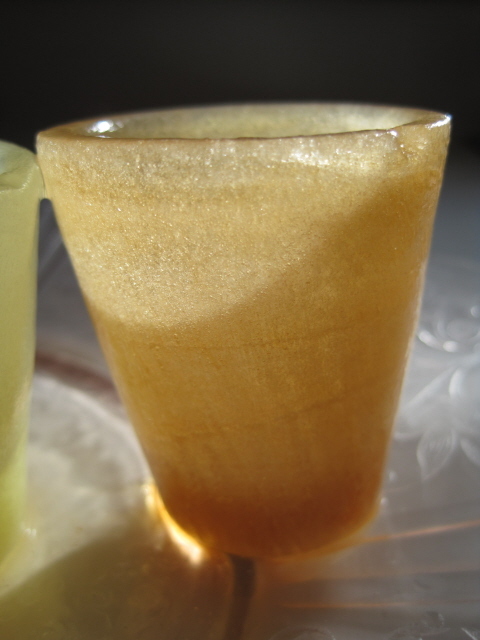 No, not "iced tea glasses" but "ice tea glasses." Really. They're ice. They're tea. They're glasses! To be exact, these glasses are made entirely of, from left, herbal rooibos tea, hibiscus herbal tea, matcha tea and cold-brewed, plain old Red Rose tea. 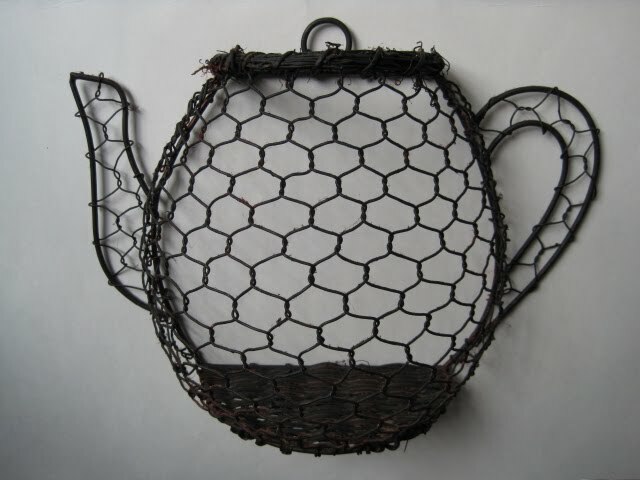 Although I am a teetotaler (or tea-totaler? 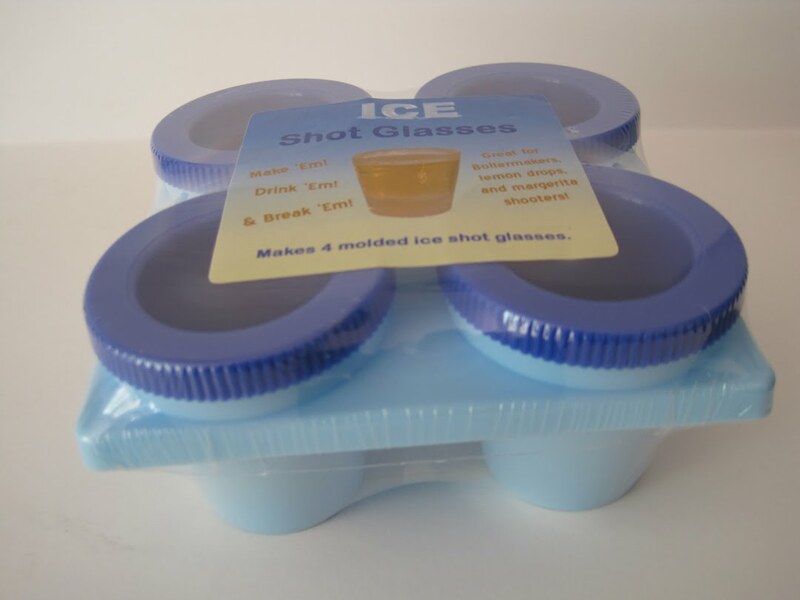 ), I could not resist buying this "ice shot glass" mold when I saw it at Marshall's for $2.99 recently. I'd seen one several years ago, didn't buy it, and have regretted it ever since. I was not going to let this one get away. 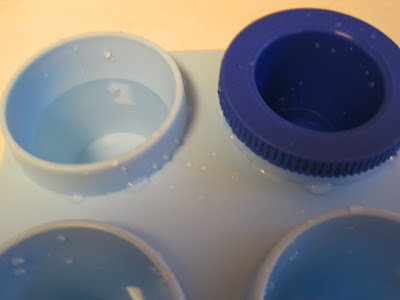 You fill each section of the mold about halfway with water (or tea), snap the dark blue lid in place, and freeze for three or four hours. I was worried I would crush my glasses when I unmolded them, but that didn't happen. 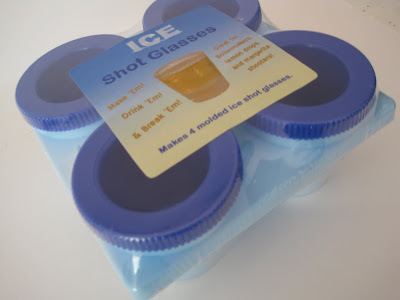 You run lukewarm water over the bottom of the mold and these little ice "glasses" just slip right out. I spent so long taking photos, mine started to melt, so if I were making these for guests, I'd probably stick them right back in the freezer until time to fill with, oh, tea sorbet, perhaps! What is it about spring that sets us all to ordering our lives? From tidying up the flower beds to cleaning out closets and reorganizing the pantry, I've been busy trying to get my house and my life in better order. Many of my friends (including some of you) have been doing the same thing. One long overdue project of mine? 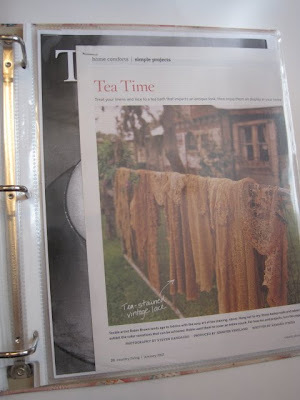 Discarding those old magazines I've been keeping just because they contained a tea article or two and getting those pieces organized. 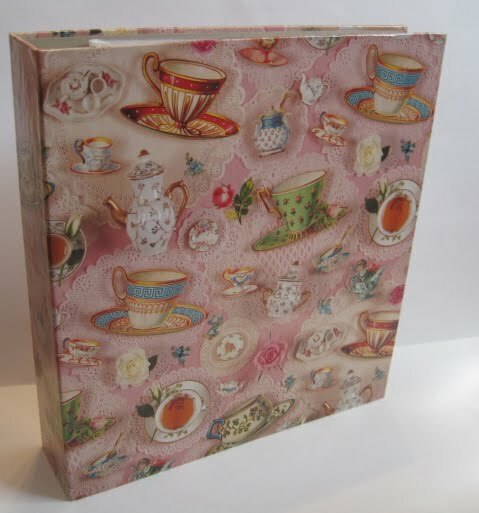 So, I emptied the pretty tea-themed notebook I'd been using to store back issues of Tea Time magazine and now it is officially my Tea Notebook. 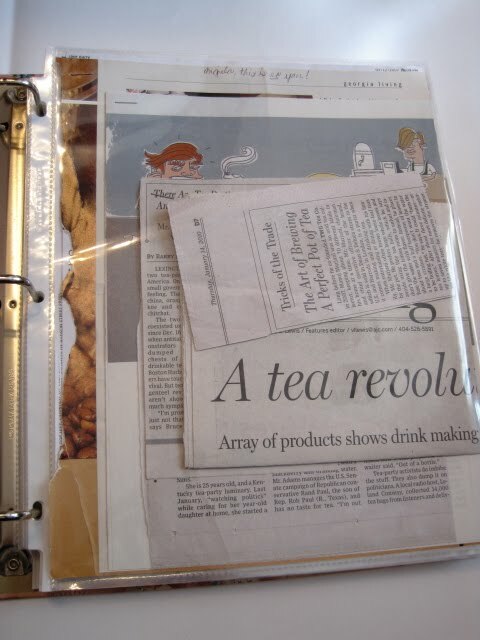 I've saved many newspaper and magazine articles over the years (friends have sent me some as well), and now they're corralled nicely in a clear vinyl page protector. I started to place every single article in the notebook in a page protector, but I'd need more notebooks (and more money), and I'm trying to be thrifty about all this. 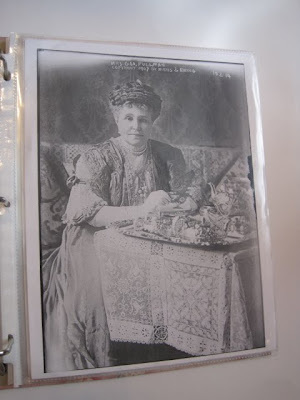 Several years ago I printed out some images I came across on the Library of Congress website, including this one of Mrs. George Pullman, who doesn't seem to be enjoying her tea very much but who amused me just the same. This pocket page of the notebook houses graphic images related to tea. Some of my favorite articles over the years have focused on tea crafts, such as this old Country Living piece on tea-stained laces. These are just beautiful! 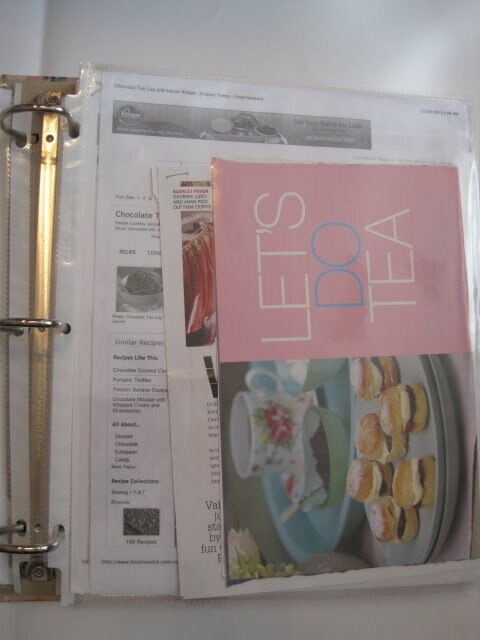 Naturally, tea parties and their menus get a page. 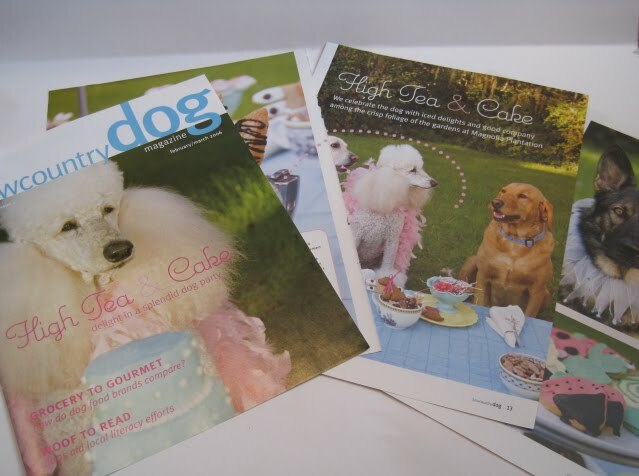 (I learned that articles from those oversized British magazines like Country Living will have to be folded in half.) 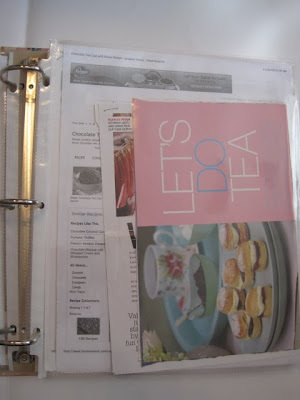 So far, the topics I've included in my notebook are Tea Tidbits (the generic articles on tea), Tea Parties (ideas and recipes), Tea Graphics/Photos, Teatime Recipes, Tea Growers (articles on Charleston Tea Plantation, Harney and Sons, etc. ), Tea History, Tea Rooms, Tea Room Recipes, Tea & Health, and Tea Crafting. What would you add if you kept (or keep) a tea notebook? Finally, I wanted you to see one of the old articles I came across from back before I started blogging. Lowcountry Dog magazine in 2006 had a feature titled "High Tea & Cake," and these pampered pooches were treated to tea at Charleston's Magnolia Plantation, complete with their own little canine treats from local doggie bakeries. Gives a whole new meaning to the phrase "You lucky dog! ", doesn't it! Tea and Books Saturday #16 - "Tea"
Big things come in little packages sometimes, and that's the case with this 50-page paperback. It may be small but it does have chapters, interesting information, and some charmingly homemade illustrations (by Maceo Mitchell). There's the usual information on tea history and production, but as always I learned something new from reading this book. 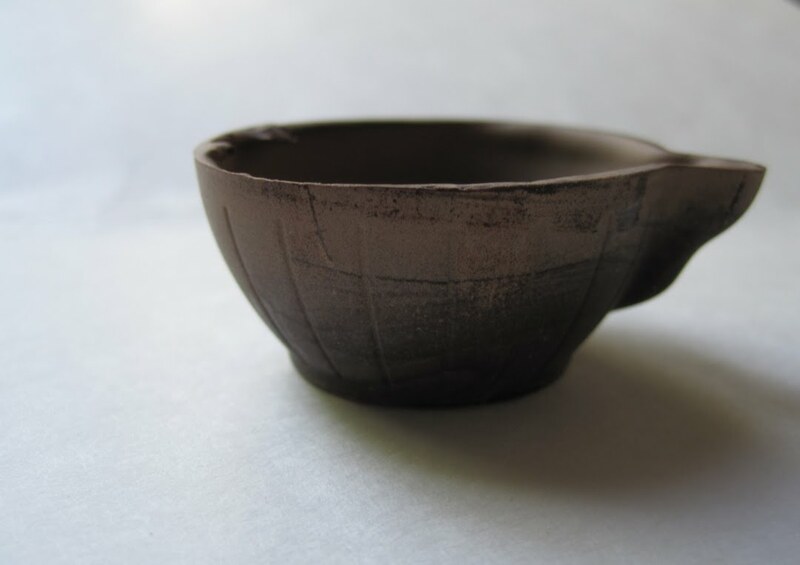 In a section on the Japanese Tea Ceremony, Chalmers writes, "The tea house was originally built entirely of natural materials and constructed in such a manner that a single blow would return the structure to the earth from which all the elements had come." If I ever build a tea house, that most certainly will *not* be my design philosophy! Like every author of a tea book or article, it seems, this author points out that herbal teas aren't really "tea" at all and are frowned upon by tea drinkers. But (there's always that "but") they do acknowledge that some folks like them. 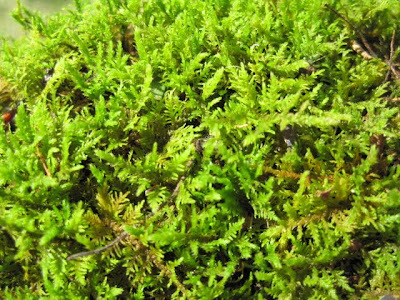 Chalmers says that "Pliny claimed that mint stops hiccups, clears the voice before making a speech and is the specific antidote for a sting from a sea serpent." Almost makes you want to get hiccups in order to try this, doesn't it? (But I'll pass on the sting from a sea serpent.) Another interesting note about this book is that it was published "in cooperation with Gill's First Colony Coffee and Tea." I'd never heard of that firm (have any of you? ), but I did a search and discovered their interesting web site here. How odd that I should discover their site thanks to a 32-year-old book! 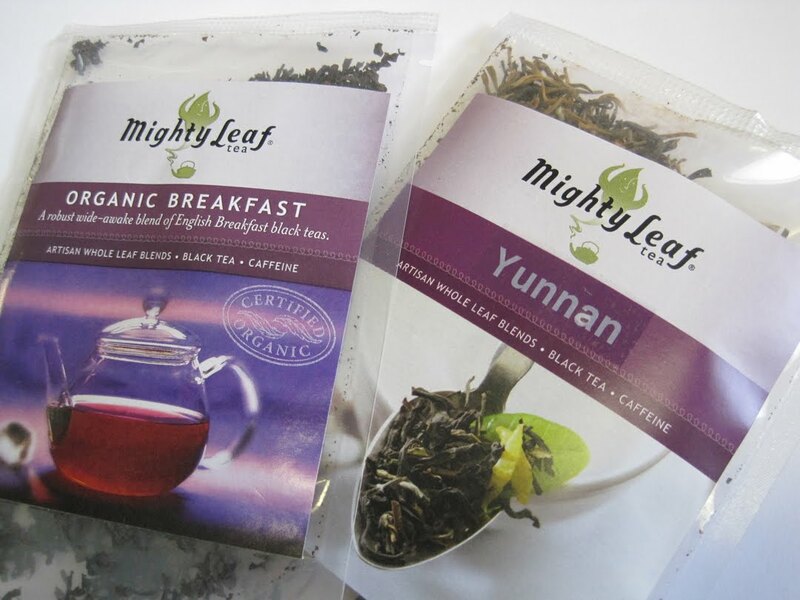 Mighty Leaf Tea sent me two new sample packets the other day, and both of the blends are black tea, which is great because it's deadline time at the magazine and I need the caffeine right now! Since these tea samples come in plastic, I get a good view of the tea leaves before I ever try them, and here you can see the leaf size of the Organic Breakfast at left and the Yunnan at right. Although I prefer "pretty" whole leaf teas from an aesthetic point of view, I've learned that I actually like the taste of the finely processed black teas early in the day when I'm trying to wake up. 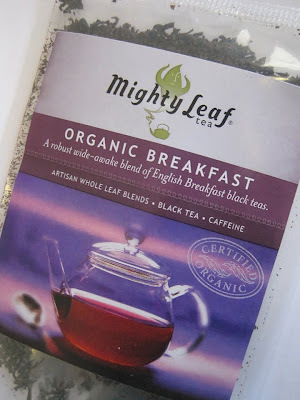 The first tea I tried was the Organic Breakfast. 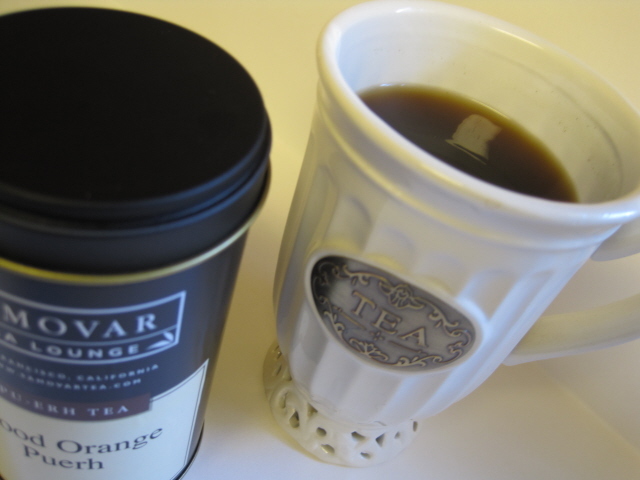 I steeped my teaspoon of tea just about three minutes since that's about as strong as I like it. I tried it black assuming I would need to add milk, but to my surprise this was a great tasting tea with no astringency! So instead of automatically adding milk to these breakfast blends, I may continue to try the shorter steeping times. 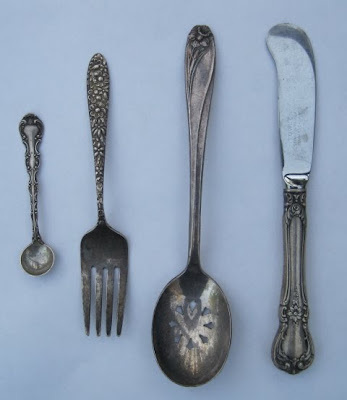 Look how nicely these pieces cleaned up! 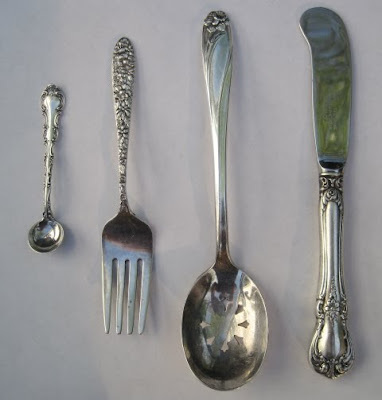 From left are a Gorham sterling silver salt spoon (Strasbourg pattern), a tiny fork whose mark I can't quite read, an 1847 Rogers "Daffodil" pattern sugar sifter spoon from 1950, and a sterling-handled Towle butter knife (I think; I used it for lemon curd on Sunday). The wonky design on the knife blade is because I was shooting the photo outdoors and trees are reflecting, I believe. 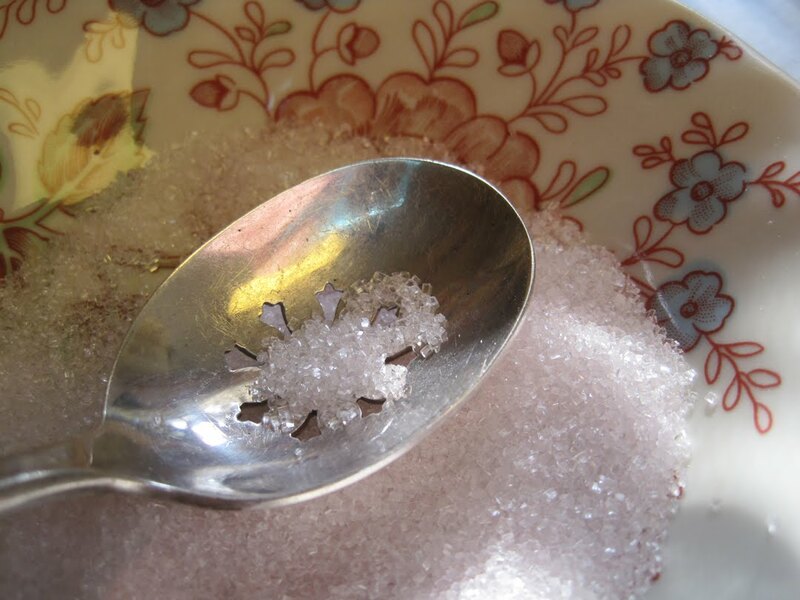 Perhaps because of my current flower obsession, I was already totally enamored of this "Daffodil" pattern sugar sifter spoon, and it ended up being quite a useful tool as well. I wanted to sift decorative pink sugar onto Pink Lemonade Cupcakes the other day, but I already had the cupcakes set inside the wrappers and needed to be fairly neat about it. With this spoon, a gentle shake of the hand slowly, slowly disperses just a little sugar at a time. When you're through, you'll have just a few grains of sugar left in the bowl. I cannot wait to use this again! 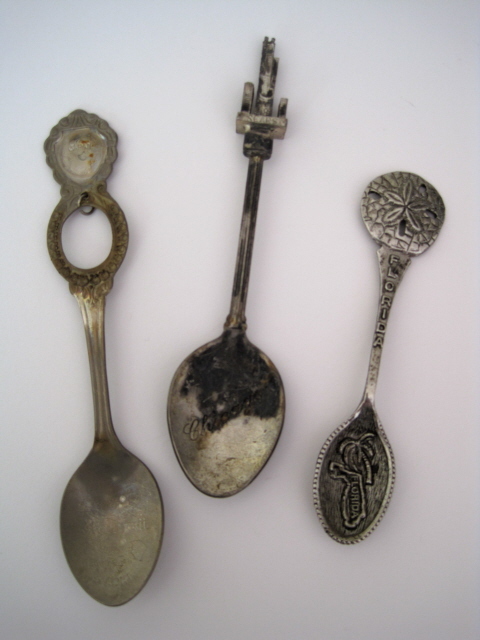 Do any of you have sugar sifter spoons? If so, what else do you use them for? 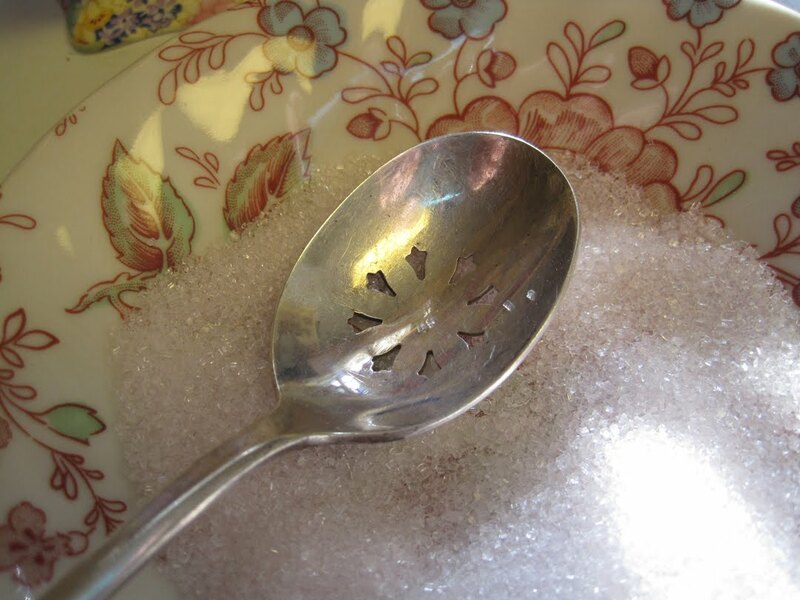 Also, I would love to find a "tea" use for old-fashioned salt spoons. Any ideas out there? I need to make sure I get my 99¢ worth out of these pieces! Obviously, I have trained my husband well because the other day he came home with a great old chair he found at a yard sale for $5. Excellent, I said, and it also made a nice spot for my new teapot planter to greet guests at my tea party. 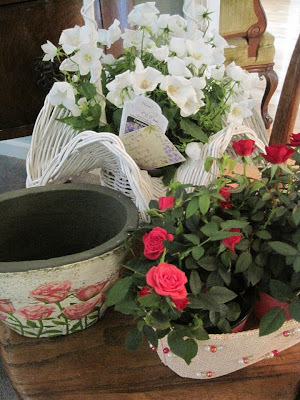 And I was just thrilled when my tea partying friends arrived on Sunday bearing these gifts for their already-happy hostess: a frilly white basket of the cottage flower Campanula, some lovely miniature roses in a pearl-bedecked basket, and a pretty planter with roses on it. How did they know I like flowers? A "Celebrate Spring" Tea Party! Tea and Books Saturday #15 - "Teatime"